The year has started with positive things and many notifications has been released in the end of last month, so this has been a fresh start for the exam year. One of the most prominent exams out of the all is the Syndicate Bank PO PGDBF Exam 2018. The exam season starts with IBPS CLERK MAINS EXAM 2017 (Yah, since the notification was announced in the year 2017) and goes on with other exams. This Syndicate Bank PO PGDBF 2018 Exam is different from the other banking Exam because this exam involves a training period of one year in the Manipal Academy. So there are two phases for the Syndicate Bank PO PGDBF Exam 2018 and also this exam propel the start of the exam season. Also this has demolished the fear among the candidates regarding the non availability of vacancies in the Banking industry. The importance for this Syndicate Bank PO PGDBF 2018 is that the total number of vacancies available is 500 and since this marks the start of the exam season in this new year, this exam has got more relevance and importance. 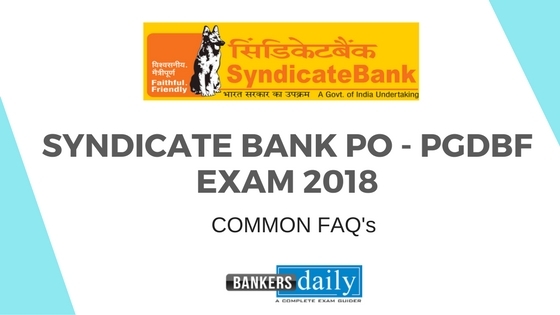 So we will be highlighting the important common FAQ’s which you will get while applying for the SYNDICATE BANK PO PGDBF Exam 2018 in this post in detail , so get your queries solved now by reading further. We have already made the notification of SYNDICATE BANK PO PGDBF Exam 2018 available in our website and you can check the same from the links that are provided below. If you haven’t started your preparations yet, please feel free to attend the STUDY Planner which focuses on the IBPS Clerk which will also be useful for your Syndicate Bank PO – PGDBF Exam 2018. Candidates can attend the same from the links that are provided below. Q1. Will the candidate be directly posted as a PO in one of the Branches in Syndicate Bank ? No. Candidates who fulfill the eligibility criteria will take the two phases of the SYNDICATE BANK PO PGDBF 2018 Exam and on successful selection, the candidate will have to undertake a one year course and on successful completion of the course within the give time period , the candidates would be provided with the appointment in the Bank as Probationary Officers in Junior Management Grade / Scale-I Officers. Q2. In Which Institute will the selected candidates be enrolled to take up the Year Long Course to get into the Syndicate Bank as Scale-I Officer ? The students who get selected in the SYNDICATE BANK PO – PGDBF 2018 will be inducted into two institutes like Manipal Global Education Services Pvt Ltd, Bengaluru which is called as MaGE and Nitte Education International Pvt Ltd., Greater Noida / Mangaluru which is commonly called as NEIPL through the current selection through the Exam 2018 – 2019. Q3. What is the total number of vacancies available in the SYNDICATE BANK PO – PGDBF Exam 2018 and what is the number of vacancies available for SYNDICATE BANK PO – PGDBF Exam 2018 ? The Total Number of vacancies available for the Syndicate Bank PO – PGDBF Exam 2018 is 500. The number of vacancies available for different categories are given below. Q4. Is there any age restriction to apply for the vacancies available in Syndicate Bank PO – PGDBF Exam 2018 ? The minimum age is 20 years and the maximum age is 28 years to apply for the vacancies available in Syndicate Bank PO – PGDBF Exam 2018. 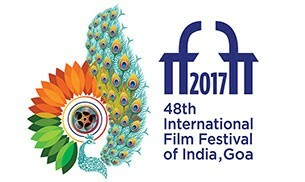 The age factor should be considered as on 1st October, 2017. A candidate must have been born not earlier than 02.10.1989 and not later than 01.10.1997 and (both days inclusive). Q5. What is the minimum qualification to apply for the vacancies available in Syndicate Bank PO – PGDBF Exam 2018 ? The candidates who wish to apply for the vacancies available in Syndicate Bank PO – PGDBF Exam 2018 is that , He/She should be a graduate with the minimum percentages as given below. Q6. Are students who are in their final year of study are eligible to apply for the Syndicate Bank PO – PGDBF Exam 2018 ? No. It has been precisely mentioned in the notification that the candidate has to be a graduate and also the results of the Graduation should be announced before 30th September, 2017. Q7. If a candidate have obtained 59.99% in his/ her graduation , Will they be able to apply for the Syndicate Bank PO – PGDBF Exam 2018 ? No. 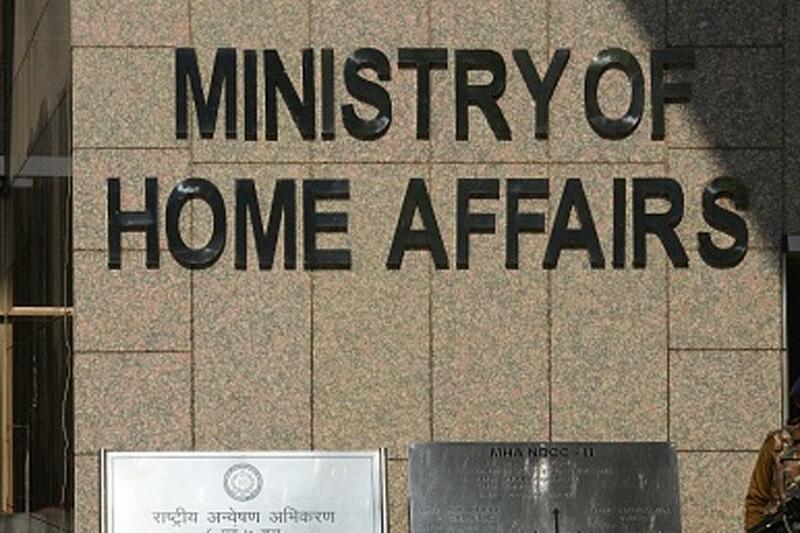 The candidate who have obtained 59.99% will be considered as less than 60% and those candidates who didn’t have the required percentage of 60 are not eligible to apply. This percentage factor is 55 for the candidates who belong to the SC/ST/ PWD category. Q8. What are the Two phases of the Syndicate Bank PO – PGDBF Exam 2018 ? Q9. Will the descriptive test be conducted as a separate Exam or along with the Objective Exam ? The Descriptive Exam will happen immediately after the Online Objective Exam and both the sections will have separate cutoff marks. Q10. What is the Exam Pattern of the Objective Online Exam for Syndicate Bank PO – PGDBF Exam 2018 ? The Exam pattern of the Online Objective Exam for Syndicate Bank PO – PGDBF Exam 2018 is given below. Q11. What is the minimum qualifying marks to clear the Descriptive Paper in the Syndicate bank PO – PGDBF Exam 2018 ? The candidate has to obtain minimum cutoff marks in the Objective Online Examination in the Syndicate bank PO – PGDBF Exam 2018. Also please remember that the candidate has to secure minimum marks in the descriptive test with 50% for general and also 45% for SC/ST/OBC/PWD to qualify for the interview and/ (or) Group Discussion. Q12. What is the approximate fee that has to be paid as part of the course fee and others ? The course fee which is mentioned in the notification released by the Syndicate bank is Rs.3.50 Lakhs and this includes boarding, lodging and course fees and other fees and also this doesn’t include the taxes and this has to be paid by the student. Q13. Do the candidate have to pay any extra amount during the course period , other than the above said course fee? Yes. 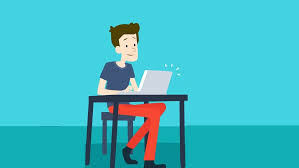 The candidate has to bear the certification exam fees like NSIM (Mutual Funds) and NISM (Depository Services) and currently the exam fees comes to around Rs. 3000/- per candidate. Q14. Can the student avail Education Loan to pay the fees for the course ? Syndicate Bank as per Synd Vidya Scheme. Q15. Will the candidates be given any incentives / stipend to during the course of study ? Yes. The candidate can avail incentives during the course of study and they are described as below. Q16. It has also mentioned there will be loyalty bonus after the candidate join as a Scale I Officer , if so what are the benefits that can be availed ? Q17. What is the examination fee to apply for the post of Probationary Officer vacancies in the Syndicate Bank PO – PGDBF Exam 2018 ? Q18. When is the Last Date to Apply for the Syndicate Bank PO – PGDBF Exam 2018 ? The last date to apply for the Syndicate Bank PO – PGDBF Exam 2018 is 17th January, 2018. Since the bank is not known for extending the application date, it is wise to apply at the earliest for the Syndicate Bank PO – PGDBF Exam 2018. Q19. What is the official Link to apply for the Syndicate Bank PO – PGDBF Exam 2018 ? So here is the official link to apply for the Syndicate Bank PO – PGDBF Exam 2018. Q20. What are the important dates regrading the Application Dates of the Syndicate Bank PO – PGDBF EXAM 2018? I M PRIYA.ACTUALLY MY QUERY IS THE HOW DIVORCE WOMAN WILL APPLY FOR SYNDICATE BANK PO.IS THERE ANY RELAXATION FOR DIVORCE WOMAN.PLS SIR REPLY FOR THIS MASSAGE AS SOON AS. WHAT HAPPEN IF I NOT FINIS H COURSE IN STIPULATED PERIOD OF TIME………?